To be effective in promoting your brand, print materials need to get your audience’s attention through eye-catching visuals and materials. But once the audience begins to pay attention, another aspect enters the equation as the most important part of your piece: its copy. Regardless of what type of product you are looking to print, it will likely include at least some text that helps get your brand message across to your audience, hopefully convincing them that becoming your customer is a good choice. To ensure that the text fulfills this goal, here are 6 keys to effective copy when printing in St. Louis. 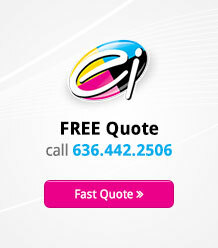 Above all, your copy has to be a perfect match for the material you are looking to print. Text on a business card, for example, has to be very different from text on a brochure. To ensure your copy matches your printed product, think about the core goal you are looking to achieve through this product. Is it educational, attention getting, or used late in the process of convincing your audience to become customers? Once you’ve narrowed down your singular goal, the next step is to understand the environment in which your printed product will live. Yard signs and roll up banners, for example, both have a similar goal: to get your audience’s attention. But their native environments are very different from each other. One will live on the side of the street and needs to get this attention for customers driving by and only see it for a few seconds. The other holds your audience’s attention span for longer at events and trade show booths – but only if it can stand out from many similar efforts by your competitors. Both of them will need different text that fits with its message and environment. Regardless of the printed product on which your text will live, one rule will always remain true: to succeed, it needs to be as simple as possible. A world in which our average attention span is now at 8 seconds necessitates advertising copy that doesn’t go into lengthy explanation, but gets to the point quickly and succinctly. Some printed materials don’t give you a choice but to keep your copy simple. 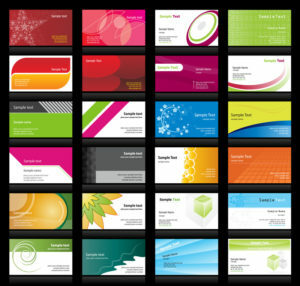 Business cards, for example, are simply too small to include paragraphs of text. The temptation is higher for postcards or brochures that allow you for more potential text space. But even here, focusing too much on text will lead to your audience struggling to stay with you until you get to your final point. One way to keep your text short and simple is to ensure that it works well together with the visuals that surround it. We’ve written extensively in this space on the importance of visuals in your printed materials; as mentioned above, they are the core element in helping your product catch your audience’s attention. So why not make them work for you in keeping attention as well? Always remember that no matter which materials you print, the text does not have to stand on its own. Your audience will only see it in connection with your visuals of choice, which is why you should always keep these visuals in mind when writing the copy. Writing text that supports rather than adds to your visuals will result in a more consistent marketing piece that successfully grasps and keeps your audience’s attention. Depending on the available space, don’t be afraid to repeat the key point you want your audience to get out of your printed piece. Especially in more complex pieces like business brochures, you don’t want to risk the possibility of your audience having forgotten your initial selling point by the time they’re done reading through it. Repeating key points without seeming repetitive is a challenging task, but it is possible. You can achieve the feat by talking about a core benefit in a couple of different ways. For example, you may mention the need for a benefit in an opening question, before getting back to how your product can solve it later in the piece. In marketing, repetition that does not sound redundant is key. When talking about your products or services, it’s tempting to list the many useful features that you think set it apart from its competition. But in truth, your audiences cares much more about what a product can do for them than they do about its features. Don’t write about what your product can do. Instead, write about what your audience stands to gain from using your products. Focusing on these benefits means talking more about your audience and less about yourself, which will ultimately result in more convincing copy. Any marketing copy is incomplete without prompting your audience to take some type of action. Even if you follow all of the above steps, neglecting to include a call to action for your audience means leaving them in a state of limbo. They may have been thoroughly convinced by your text, but simply have no way of getting closer to becoming your customer. Depending on the goal of your printed material (see step 1), that call to action may vary. You may ask your audience to contact you, visit your website, or buy your product. But your text should always end with some type of action prompt, which ensures that interested members of your audience have a ‘next step’ to take after your copy has hit home. Visuals ensure that your St. Louis printed materials look great and catch your audience’s attention. But without effective text, which functions as the lifeblood of your printed piece, you will have little substance to help promote your business. The above keys help you develop successful copy that helps you and your business.